This summarizes one’s involvement with Bernard Cornwell’s latest tale of Uhtred of Bebbanburg and the making of England. This latest story of the bloody conflict between Saxon and Viking is, like his other novels in this series, gripping, exciting, and engaging. It is another great read from the masterful author. 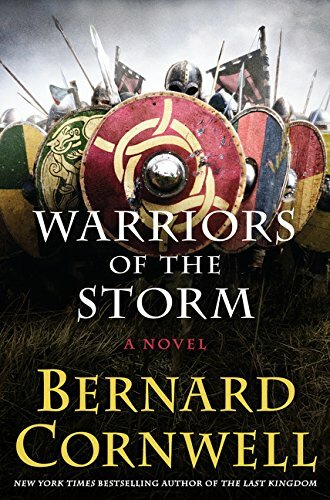 Warriors of the Storm is the ninth book in the Saxon Tales series. It will not disappoint. It is divided into three major sections and each one will have you wondering how it fits in. In each section our hero’s carelessness has you speculating what will happen next. Will he finally meet his end? There is enough suspense to keep you well engaged. With that said, the first chapter sets the tone for the story that follows. Wonderment—the fire to the nor’west—what is it? Who set it? What is going on? Carelessness—a fast ride with few security measures to find out, and of course a little skirmish. Suspense—the setting of the stage for the remainder of the book. Then wonderment once again. How will the story unfold? You need to read the book to find out the answers to these and other questions you will ask yourself as you follow Uhtred on his venture. You think you know how it all works out, right? You better think again. The hero always wins, doesn’t he? What if he doesn’t? Does the series end with his death? After all Uhtred does have a son, no he has two. What if Cornwell throws a curve ball and the story doesn’t go as you might expect? What then? Well . . . you simply have to read the book. Oh, by the way, he does throw the proverbial curve ball in that first chapter, and it makes the book even more interesting to see how it plays out. We soon learn that the Vikings led by Ragnall wanted to conquer Ceaster and thence Mercia and later all of England. Thus, he set a trap for Uhtred and his forces. Uhtred, equally as cunning, did not bite, for he had set his own trap for Ragnall and his men. Did either man oblige the other? Suspense and deception! At one point it appeared that the protagonist had flinched. It leaves the reader wondering if this was the author’s plan all along. But it might be worth remembering the captivating words found in the novel El ingenioso hildago Don Quixote de la Mancha—“No todo lo que brilla es oro.” (All that glitters is not gold) For Bernard Cornwell adds a twist to the story; no he adds several. If you read the book you will probably say to yourself, “I knew the plot wouldn’t be so easy to figure out.” So you simply have to read the book. As if out of a Shakespearian play, Hester reappears. For those who have read other books in the series know who he is and what he represents. To those who have not, you will be introduced to this, and other old characters you will not know. To old and new his presence, as with the others of which I am speaking, their presence speaks for itself. On need but note that Cornwell’s books are always full of twists and turns and this one is no different. It is full of wonderment—what is going to happen next, or where is this little bunny trail taking us, why now, why here? To find out you need to read the book. Uhtred has always told his subordinates to be aggressively cautious and not to rush in for only fools do that. But in this story he seems to continually throw caution to the wind—carelessness on his part. No, he justifies his actions as gut instinct, his sixth sense if you will. Does his rationalization get him into trouble? Well, you simply have to read the book. A Cornwell novel is always full of suspense, and this one is no different. Time after time the suspense is intense. It will have you on the edge of your seat. You simply need to read the book to experience it. If you are new to this series, this book will send you back to the first book of the saga because you’ll want to know how Cornwell got us to this point. If you have read the other books in this series, you’ll probably be wondering which trail Cornwell takes us down. Does the series end here, or does it continue? You need to read the book to find out. Then again, Cornwell might leave us hanging. Donald Maccuish is Associate Professor, Strategy, Leadership and Military Ethics at Air Command and Staff College. He is a retired Army Lieutenant Colonel with over 26 years’ active and reserve service in airborne, special forces, and intelligence units. He is well published in the areas of leader accountability, morality in war, Responsibility to Protect, and distance learning.